Of all the countries in the world, Barack Obama sees the United States as one in need of fundamental transformation. Truly warped yet completely expected coming from such a devout Leftist. Nor was it mere talk. Obama went on to essentially nationalize health care, 18 percent of the U.S. economy — after passing an $833 billion stimulus that precipitated an unprecedented expansion of government spending. By the White House’s own reckoning, Washington now spends 24 percent of GDP, fully one-fifth higher than the postwar norm of 20 percent. As for the second part — enlargement — Obama had already begun that in his first term with Obamacare. Monday’s inaugural address reinstated yet another grand Obama project — healing the planet. It promised a state-created green-energy sector, massively subsidized (even as the state’s regulatory apparatus systematically squeezes fossil fuels, killing coal today, shale gas tomorrow). There’s controversy at a Talbot County school after two 6-year-old boys were suspended while playing cops and robbers during recess and using their fingers to make an imaginary gun. “It’s ridiculous,” said parent Julia Merchant. This is the second time a Maryland child has been suspended for such play. Earlier this month, 6-year-old Rodney Lynch was suspended from his Montgomery County school after pretending to fire an imaginary gun more than once. “Just pointing your fingers like this and then she did the pow sound and I just went like that and then I got sent to the office again,” Lynch said. The school reversed its decision after Rodney’s parents appealed. Amid all the asinine calls to “do something for the children,” it would be nice if a few adults took the reins. What happened at Sandy Hook was unspeakably awful, but it is no reason for us to turn ourselves into blithering fools. Or is it? New York’s State Assembly isn’t so sure. Last week, it rushed through an astonishingly rash piece of legislation that, among other things, has put mental-health professionals in a tough spot, called into question the right of cops to carry their duty weapons, and almost certainly violated the Constitution as defined in D.C. v. Heller. Not to be outdone, the president of the United States stood in front of the world’s cameras and read out letters written by children, praising their great wisdom and making them the centerpiece of his push for new legislation. He was serious. That America has not rejected this trick outright and demanded to be treated with a little more respect by its employees in the government is not a good sign. Likewise, that the teachers responsible for suspending or punishing children for pointing imaginary guns at each other or for talking about Hello Kitty bubble blowers have not resigned or been fired in disgrace is an indication that our common sense is being overridden by our emotions. (“If it saves just one teacher . . .”). After all, if the children are so wise, then perhaps they should be running the schools instead. Raise your hand if you agree . . . While listening to people on radio discuss the subject of gun control, I have heard more than a few of them say that the 2nd Amendment gives us the right to keep and bear arms. It does no such thing. American liberties, including the right to bear arms, pre-exist the federal government, and are defined and protected in the same document from which the state derives its authority and its structure. In a free republic, the people cannot be disarmed by the government, for they are its employers, and they did not give up their individual rights when they consented to its creation. There is no clause in our charters of liberty that allows for the people to be deprived of their freedom if and when a few individuals abuse theirs. The 2nd Amendment does not give us the right to keep and bear arms. It merely makes explicit the fact that the government does not have the power to infringe on that already existing right. In the wake of the recent shootings, the liberal media have concluded we need more gun control. President Obama just signed 23 executive actions related to guns, and promises to do more later. To them the logic seems obvious, that more guns mean more deaths, suicides, and accidents. And the U.S. supposedly has very high murder rates, they argue, because our nation is teeming with guns. So with stricter gun control, we would suffer fewer murders and less violence. Or as the New York Times earlier this month put forward the notion: “Generally, if you live in a civilized society, more guns mean more death.” The claim is all over the news from CNN to various “Fact Check” articles. It would be nice if things were that simple. The evidence — and there is plenty of it — points to the very opposite, that cutting access to guns mainly disarms law-abiding citizens, making criminals’ lives easier. Guns let potential victims defend themselves when the police aren’t there. 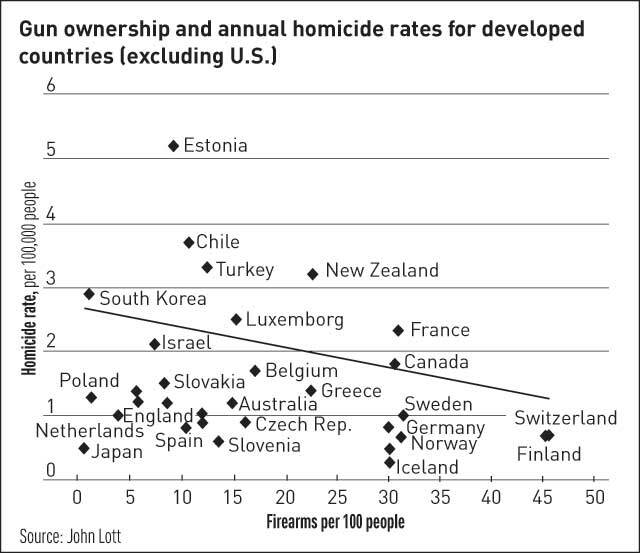 First, let’s just be clear that lots of nations, including “civilized” ones, suffer from both higher overall murder and gun murder rates. Indeed, we are very far from the top. In 2011, the U.S. murder rate was 4.7 per 100,000 people, the gun murder rate was 3.1. Much of Eastern Europe; most of Southeast Asia, the Caribbean, and Africa; all but one South American nation; and all of Central America and Mexico suffer even higher murder rates than we do. For example, despite very strict gun control, Russia’s and Brazil’s homicide rates over the last decade averaged about four to five times higher than ours. Indeed, if you are going to look across all nations and not just a select few, what you find is that the nations with the strictest gun control tend to have higher murder rates. The New York Times and others have made much from comparing some arbitrarily defined group of “civilized” nations. But even with the very questionable data on gun ownership that the Times prefers to use from the Small Arms Survey, the results do not imply the lesson that gun control advocates think they do for the U.S. If you graph (see above) their measure of gun ownership with homicide rates, higher gun ownership means fewer deaths. A similar pattern holds for all countries as well. Many liberals conveniently focus on a few low-murder-rate countries such as England. Even worse, they ignore that the countries they idolize enjoyed even lower murder rates before they banned guns. The seemingly most obvious way to stop criminals from getting guns is simply to ban them. So what happened in the countries that banned either handguns or all guns? It did not go well: In every single place that we have data for, murder rates went up. Chicago and D.C. provided spectacular failures within the U.S. But this has been true worldwide. The U.K., Ireland and Jamaica, despite being island nations that can’t blame a neighbor for supplying guns, have suffered more murders after gun control was passed. So what has happened when Americans have been allowed access to guns? Consider a simple fact. Concealed handgun permits and gun sales have been soaring over the last four years, as regular people have worried that Obama would push through gun control. Yet, murders and violent crime have been falling. That isn’t just a recent phenomenon. If you look at the U.S. over the last few decades, even after accounting for other factors, the states that have had the biggest increases in concealed handgun permits and gun ownership have seen the biggest drops in murder and violent crime rates. Gun control just does not work. Indeed, it makes things worse. Moreover, none of the weapons banned under the 1994 legislation or the updated version are “military” weapons. The killer in Newtown used a Bushmaster .223. This weapon bears a cosmetic resemblance to the M-16, which has been used by the U.S. military since the Vietnam War. The call has frequently been made that there is “no reason” for such “military-style weapons” to be available to civilians. Yes, the Bushmaster and the AK-47 are “military-style weapons.” But the key word is “style”—they are similar to military guns in their cosmetics, not in the way they operate. The guns covered by the original were not the fully automatic machine guns used by the military, but semiautomatic versions of those guns. The civilian version of the Bushmaster uses essentially the same sorts of bullets as small game-hunting rifles, fires at the same rapidity (one bullet per pull of the trigger), and does the same damage. The civilian version of the AK-47 is similar, though it fires a much larger bullet—.30 inches in diameter, as opposed to the .223 inch rounds used by the Bushmaster. No self-respecting military in the world would use the civilian version of these guns. A common question is: “Why do people need a semiautomatic Bushmaster to go out and kill deer?” The answer is simple: It is a hunting rifle. It has just been made to look like a military weapon. But the point isn’t to help hunters. Semiautomatic weapons also protect people and save lives. Single-shot rifles that require you to physically reload the gun may not do people a lot of good when they are facing multiple criminals or when their first shot misses or fails to stop an attacker. The large-capacity ammunition magazines used by some of these killers are also misunderstood. The common perception that so-called “assault weapons” can hold larger magazines than hunting rifles is simply wrong. Any gun that can hold a magazine can hold one of any size. That is true for handguns as well as rifles. A magazine, which is basically a metal box with a spring, is trivially easy to make and virtually impossible to stop criminals from obtaining. The 1994 legislation banned magazines holding more than 10 bullets yet had no effect on crime rates. Ms. Feinstein’s new proposal also calls for gun registration, and the reasoning is straightforward: If a gun has been left at a crime scene and it was registered to the person who committed the crime, the registry will link the crime gun back to the criminal. Nice logic, but in reality it hardly ever works that way. Guns are very rarely left behind at a crime scene. When they are, they’re usually stolen or unregistered. Criminals are not stupid enough to leave behind guns that are registered to them. Even in the few cases where registered guns are left at crime scenes, it is usually because the criminal has been seriously injured or killed, so these crimes would have been solved even without registration. Canada recently got rid of its costly “long-gun” registry for rifles in part because the Royal Canadian Mounted Police and the Chiefs of Police could not provide a single example in which tracing was of more than peripheral importance in solving a gun murder. If we finally want to deal seriously with multiple-victim public shootings, it’s time that we acknowledge a common feature of these attacks: With just a single exception, the attack in Tucson last year, every public shooting in the U.S. in which more than three people have been killed since at least 1950 has occurred in a place where citizens are not allowed to carry their own firearms. Had some citizens been armed, they might have been able to stop the killings before the police got to the scene. In the Newtown attack, it took police 20 minutes to arrive at the school after the first calls for help. The Bushmaster, like any gun, is indeed very dangerous, but it is not a weapon “designed for the theater of war.” Banning assault weapons will not make Americans safer.